I have added several Hall of Fame signed baseballs to my collection through the first day at The National. Like I said in last night's post, I went well above what I had budgeted for the day, but I knocked out so much of what I had set out to get, it makes the next few days more of an opportunity to just pick up random things. This is my 111th Hall of Fame signed baseball. Reese (b. 1918 - d. 1999) played in the majors from 1940 to 1942 and 1946 to 1958 (interrupted by World War II) for the Dodgers of Brooklyn and Los Angeles. The unassuming captain and heart and soul of the Brooklyn teams of that era, Reese played in seven World Series (1941, 1947, 1949, 1952, 1953, 1955 and 1956), winning one (1955). He retired after the Dodgers first season in LA with 2,170 hits, 126 home runs and a .269 batting average. 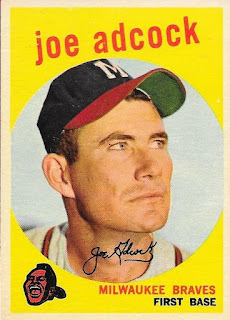 Reese was an All Star in 10 seasons and finished as high as 5th in the NL MVP voting (1949). 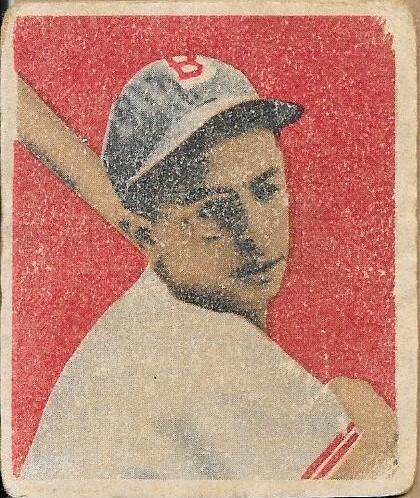 Reese was elected to the Hall of Fame in 1984 by the Veterans Committee. I'm going to do a day-by-day recap of the National Card Show when I get back home, but I will be posting bits and pieces while I am here. Today marked a big day for me in my collection. 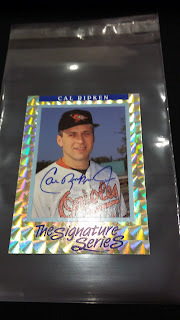 I have been collecting Cal Ripken since 1990 and today marks my most anticipated addition to that PC. 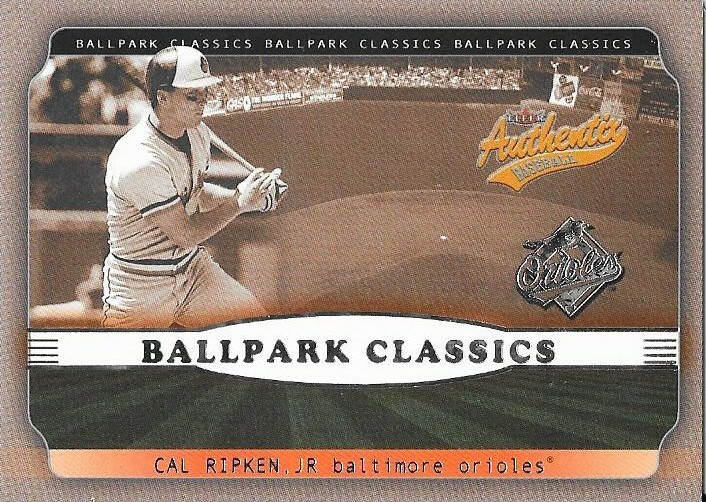 Since it was issued in 1992, I have always wanted the 1992 Donruss Elite Cal Ripken autograph. One of the first autos issued in packs (I think UD did Reggie Jackson a few years prior), this was a sought after card back during the Junk Wax era. I opened a ton of 1992 Donruss, just to find that I didn't have a magic touch that would yield this card. 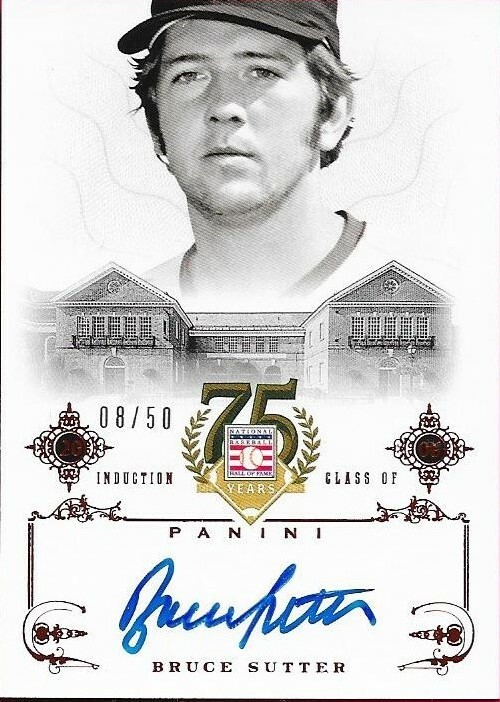 Fast forward 23 years and I was finally able to track down a nice version of this card at the 2015 National Sports Collector's Convention in Chicago. Max, Andrew and I walked around the show all day today asking vendors if they had this card. Each search turned up empty, and most requests caused vendors to look at me like I was crazy. 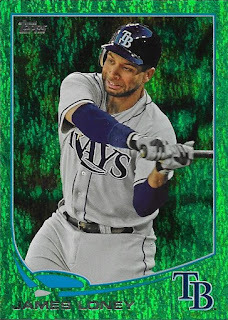 Finally, around 3:45 PM, Max had to leave, but Andrew and I hooked up with my good buddy, Frankie (from the blog - My Life in the Sports Card Hobby), and after about 5 minutes into resuming our search, we found the card. Let's just say that the vendor told us later that my reaction to when he said he had the card made the show for him. I was so very happy that I got the card. I paid the sticker price for the card, as the vendor didn't budge, but it really was a fair deal (he did throw in a Brooks Robinson auto). My budget for the National is already busted, but I met all of my goals. 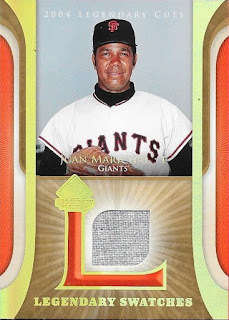 By the way, this card is numbered 3,202/5,000. Frankie was kind enough to give me a magnetic case and a team bag to slab it in. I'm so happy that I found this card, and I'm even more happy that I was able to experience the thrill of the hunt for it with several of my close friend. This sure beat landing the card on Ebay and it coming in the mail. I enjoyed the quest with Max, Frankie and Andrew, and to me, that made getting it even more special. Please continue to check back to see our progress from The National. We are only one full day into it with three to go. The next few days surely won't have as much cash change hands, but I do intend on continuing to pick up several items for myself and some friends. An early blog post today, since I am going to be heading to the airport in a little while to begin my trip to the National. I added something to my list of things I wanted to do, since I stopped by my LCS at lunch yesterday. 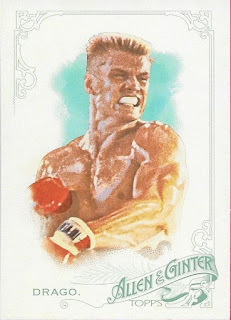 I bought four packs of 2015 Ginter since I had heard that there were cards of characters from the Rocky series of movies. My goal is to get all of them, but the Apollo Creed is the one I really want. In the four packs, I did pull one of the characters, Drago, from Rocky IV. The movie that ended the Cold War is one of my all-time favorites, so I was happy to pull the Drago. I would really like the Dolph Lundgren autograph, since the pose is different (look it up, it's awesome!). 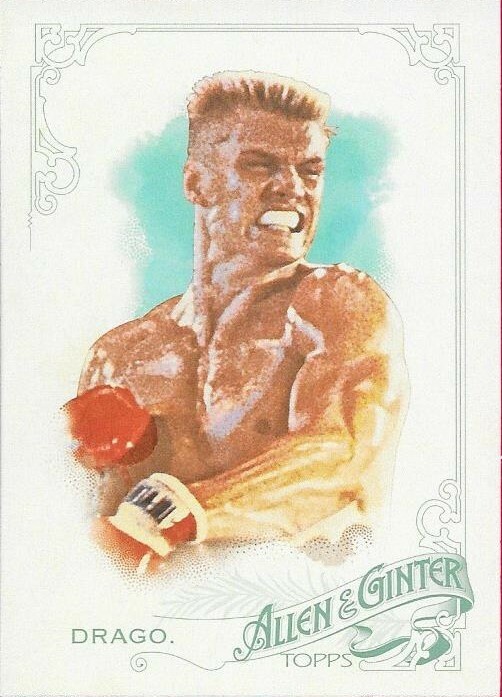 I also wouldn't mind pulling the Sylverter Stallone auto, you know, since it is selling for a few grand on Ebay. I did have another nice pull, this 10th Anniversary framed Justin Upton card was really nice. It is not numbered, but looks really cool. I saw a Brooks Robinson on Ebay last night while looking around, so I may pick one up at some point. 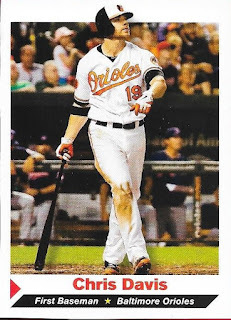 So, I think I want to bust a box of 2015 Allen and Ginter while I am at the National. I know prices will be pretty good for boxes, so this is something that is well within reach. I wonder if the guys I'll be meeting up with would want to bust a box as well? A pack opening party is always a good time. Anyway, next time I blog will be from the Windy City. I'm really excited to see what is in store for us at the National. At this past weekend's card show in Raleigh, I met another fellow blogger in person. Tim, from the blog "I Love The Smell of Cardboard in The Morning" was kind enough to hang out with me for a while, and even delivered a care package to me. In the package was a bunch of Orioles cards and three 2013 Topps Emerald Parallels that I needed for my set. No, I haven't forgotten this set, I just have been wrapped up with other sets, so this one has gone on the shelf for now. I do intend to pick up any loose ones I see at the National. I'm not sure if I will see any there, but I will be looking. Tim joins the list of folks who have been able to locate Cal cards that I need for my very huge PC. This is a major feat, finding cards I need, as I have nothing posted showing what I have. That would take forever. Anyway, Tim came through and added three new Cals to the PC. Thanks so much for coming by, and even more for the care package. It was really nice to meet Tim, and I hope any other bloggers in the general vicinity of Raleigh, NC will come and see me at the next show in September. I got two packages in the mail from my friend, Dylan, who sent me an Adam Jones Sports Illustrated in one package, and some Orioles (and a set need) cards in the other. The above Joe Adcock is a card that Dylan picked up to help me with my 1959 set, and he hit a home run. The card is in awesome shape. Additionally, Dylan made a little pocket list for me to make it easier for me to find the rest of the cards that I need for the set. That was a really cool gesture, and I was thankful for the effort he put in. The Adcock leaves me with 30 more that I need in order to complete the set. One of my main goals for the National is to come home with those 30 cards. I've got my fingers crossed. Dylan also included quite a few cards that I needed for my various PCs. He had complained a few times about how difficult it was for him to find cards that I needed. This is something that I hear a lot, which is why I added the Google docs spreadsheet to my wishlist. One can at least tell which Davis and Reimold cards I have. Anyway, thanks so much for the packages, Dylan. I liked all of the cards! I have to say, I had one of my most successful card shows to date. Not only with selling, but with the overall atmosphere of the show. It was by no means busy, which would have been even better, but sales each day were pretty good for me. I was able to meet up with several people throughout the show, and also got a couple new blog readers out of it. That was really cool. I hope it sticks. I met up with a fellow blogger, Tim from I Love The Smell of Cardboard In The Morning. He came by my tables at the end of the show and introduced himself. We chatted for quite a while, and he was nice enough to hand deliver a care package. I'll post that tomorrow. Also, my buddy Tyler was able to have his own table today and did pretty decently selling. Better yet, my son Chris got HIS own table, and actually sold a few cards himself so he would have a little spending money for the National. In all, it was a really fun and successful day. I did break my rule again (rules are made to be broken, right? Or is it supposed to be records? I forget) and buy a few "well loved" vintage cards from fellow dealer, Kurt. I bought from him at the last show, and figured I would see what he was offering today. The above Mike Cuellar rookie is a card that I already had in my collection, but I also needed one for my '59 set. This one is in really good shape, and will fit nicely into the set. I do quite enjoy the 1949 Bowman set, so when I saw this Dom DiMaggio for a couple bucks, I figured I would pick it up. It is pretty rough, but still looks so cool. 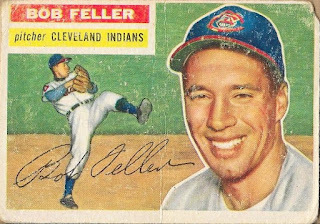 The last of the vintage cards was this 1956 Topps Bob Feller for the Feller PC. I will probably upgrade it at some point, but for now, this one will do just fine. Something really cool that happened at this show started on Friday and continued into today. I met a guy named Kevin on Friday evening. He saw that I had a lot of Orioles stuff for sale, so he mentioned that his son would like what I had and would be back on Saturday. They did, in fact, come back and his son, Brian, bought a couple cards from me. 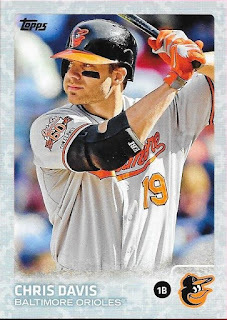 They were really looking for some Chris Davis rookies, but I didn't bring any of the extras that I had with me. So, I promised Kevin that I would send them a few in the mail since he didn't think that they would be back today. Well, Kevin made a point to come back today, and was kind enough to give me a gift after he had checked out my blog. He gave me the above 1983 Orioles World Series Champions Coke Bottle, which I really appreciated. The bottle is something that Kevin has hung onto since it was produced, and now I have it. That was really cool of him to hook me up. In return, I will be hooking Brian up as well. Pay it forward, as they say. So, I would like to thank everyone who came by my tables this weekend, and I hope you know that the time I spent talking cards was something I truly enjoyed. I've been set up at the three-day card show in Raleigh this weekend, and so far, the first two days have gone pretty well. I have already broken even with another day to go. That is always good, so anything else I sell is bonus. I met a lot of cool folks today, and even seemed to brighten a few kids' days. There was a father and two sons who came by my tables today, and we talked at length on two separate occasions. The boys actually spent quite a bit of money, which I was very appreciative. I ended up cutting them some great deals on some autographed cards, and even gave them a few Orioles rally towels to try to help out the O's mojo and bring them back into the win column. I think it worked, since the O's beat the Rays today. I hope it holds up. That family was really nice, and I was happy to chat baseball with them. I hope they come back, and I also hope they read my blog. You know, since I plugged it all day, to anyone who would listen. Shameless plugs and all. They weren't the only group that I had lengthy conversations with; There were other Oriole fans who came by and chatted with me. My favorite part of doing these shows is the ability to sit and talk cards and baseball with people. I sincerely enjoy it, and I hope it shows when folks come by. I told a guy I met at the last show, who I now consider a friend (his name is Dilan), that I have gone to shows for a long time, and I have met several dealers who seem as if you are getting in their way when you want to look at a card. I do my best to not be like that. Speaking of Dilan, he came back and chatted with me for a bit. He came to the last show I did in June, and actually followed up with me afterward, when I gave him one of my business cards. They paid off. It was really cool seeing Dilan again, and being able to chat with him for a while. Also, a true highlight of the day, was being able to finally meet my friend, Ryu, in person. Ryu, whom I met on Instagram, lives near Raleigh, but has always been busy with baseball when I would come up for shows. He was finally free on a weekend, and was able to come to the show. I was really happy to meet him and say hello. That really made my day. He's an awesome guy. I have also had the pleasure of helping a good friend of mine break into selling at this show. My buddy, Tyler, has been wanting to try to raise some funds to help with tuition, so he thought he could come to the show to sell some cards. I lent him some space on my table and helped him price cards. So far, he has sold a little bit, but still has tomorrow to help sell some more. I had a rule for this weekend's show - Don't buy anything. Yeah, that lasted a while. I bought the above Chris Davis 2014 Panini National Treasures patch card for $7 from the dealer next to me. I saw it yesterday, and he didn't want much for it, so I figured, "Why not?". 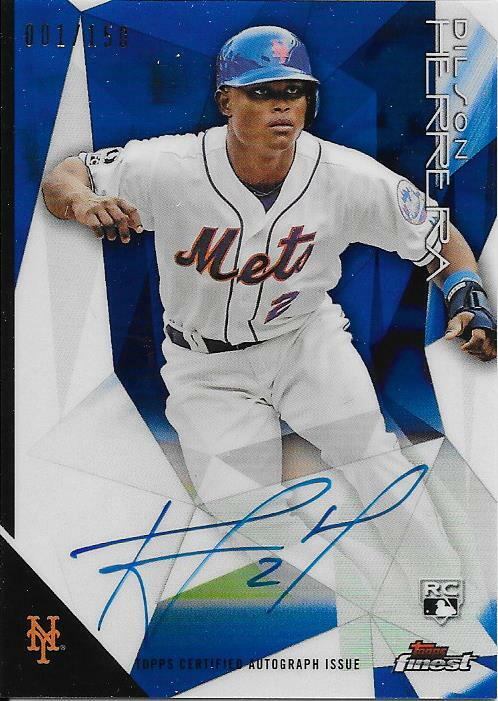 The card is numbered 24/25 and looks really cool. Finally, after a little over a month, my son, Chris, came home from the Grandparents Tour 2015. He has grown some since he left, and I sure missed him. I had a really great show so far, and there is still tomorrow to go. I hope it goes well! I got a nice surprise in the mail today. 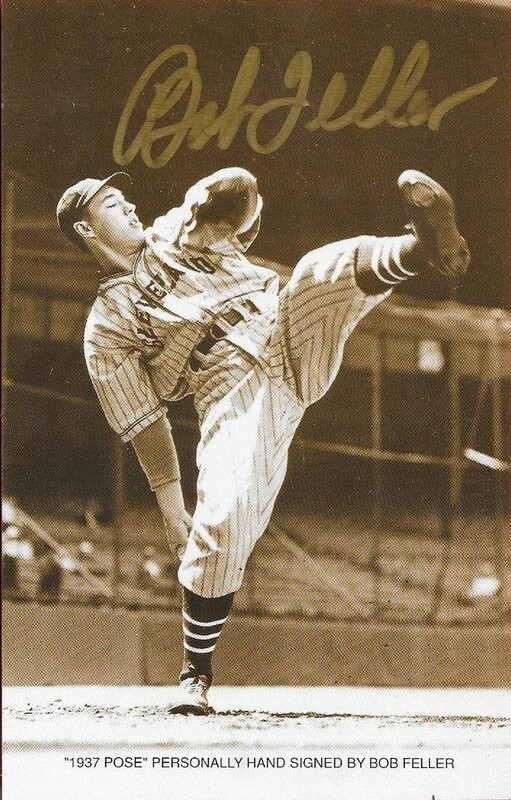 A guy I know from Instagram, Jacob, sent me this Bob Feller signed post card as an apology for something he did a few days ago. I won't get into what happened, but the fact that he apologized was enough for me. I definitely didn't expect anything in the mail, and I was very surprised when he told me that it would be a Bob Feller autograph that he would be sending. 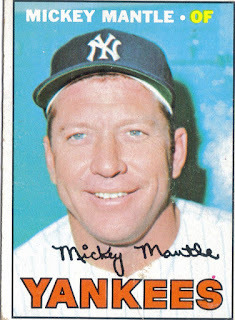 I have PCed Feller since 2010, now, and have quite a few autographs and cards. Feller was an amazing pitcher in his day, and was also a great American. I really appreciate Jacob sending this autograph, even though it wasn't necessary. I accepted the apology well before the gift was sent. That being said, though, I'm keeping this!! The National is creeping ever so closely now. Today, I got my autograph voucher tickets for the first two sessions that I purchased. Last time when I went (2012) I had voucher numbers 4 and 5 for Ralph Kiner and 9 and 10 for Frank Robinson. Funny thing is, both of those guys canceled and I ended up with Jim Rice and Joe Morgan. 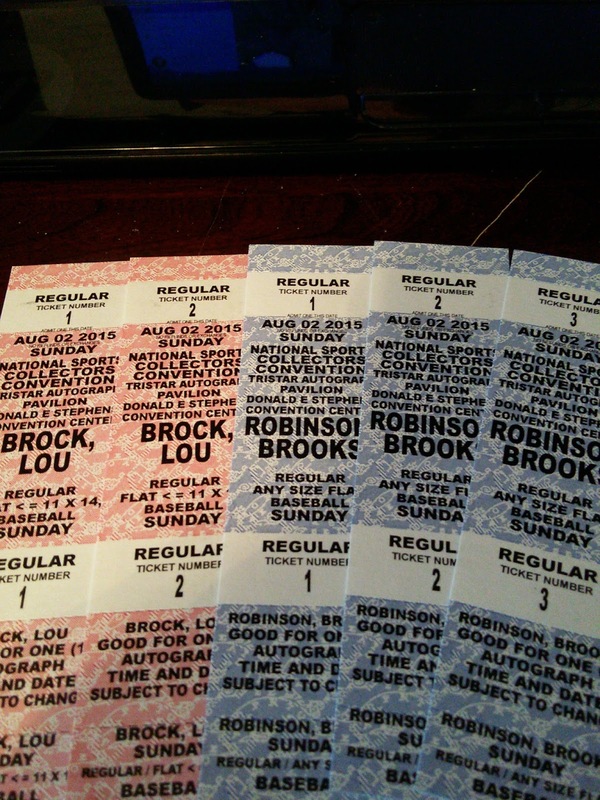 I just think it is really cool that I got numbers 1-2 for Brock and 1-3 for Brooks. I imagine my numbering for Hulk Hogan will be a bit higher, since I bought these during the pre-sale and waited a bit to get Hogan. How it works is, they call the tickets by number, so, like 1-50 will be called, then 51-100, and so on. So, since I am so low, I can camp out and get in line quickly, get my stuff signed, tell Brooks he is amazing, then head on over to Lou Brock. I think this will work out in my favor, since both of them are signing on Sunday. I won't be stuck in a line forever and can make sure I have enough time for both guys. I need Brock on a baseball for my HOF collection, and I am getting Brooks on an 8x10 photo of he and I together. Chris is getting Brooks on a ball. Andrew is also going with me to Brooks and he has some plans of his own for Brooks that I'm sure he will share on his blog. Andrew is accompanying me to Brock, and both of us are getting him on baseballs. Lately, I haven't had much to write about, so I have been working toward straightening up and getting ready for the National. 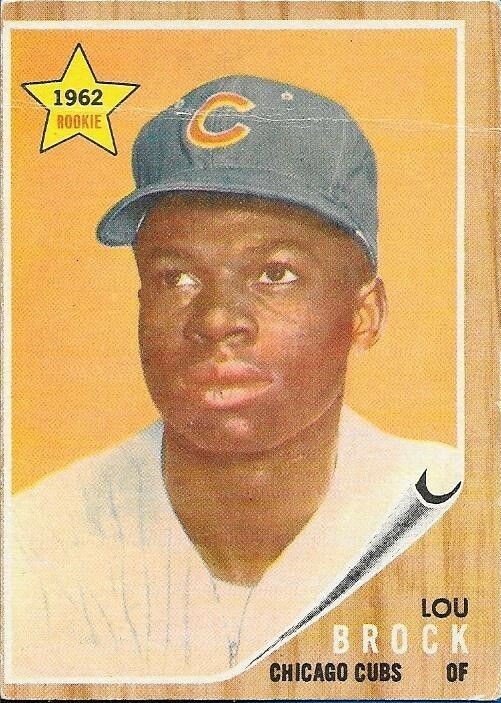 One of the things I wanted to do was list out all of my needs for the 1967 Topps set. Not because I am officially doing the set at the moment, but it gives me a finite list, just in case I see some deals. 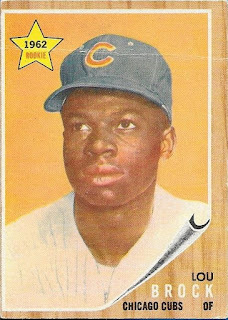 I realized that I need a lot more cards from the 1967 set than I initially realized. I also realized, however, that I had a lot more big names than I realized as well. 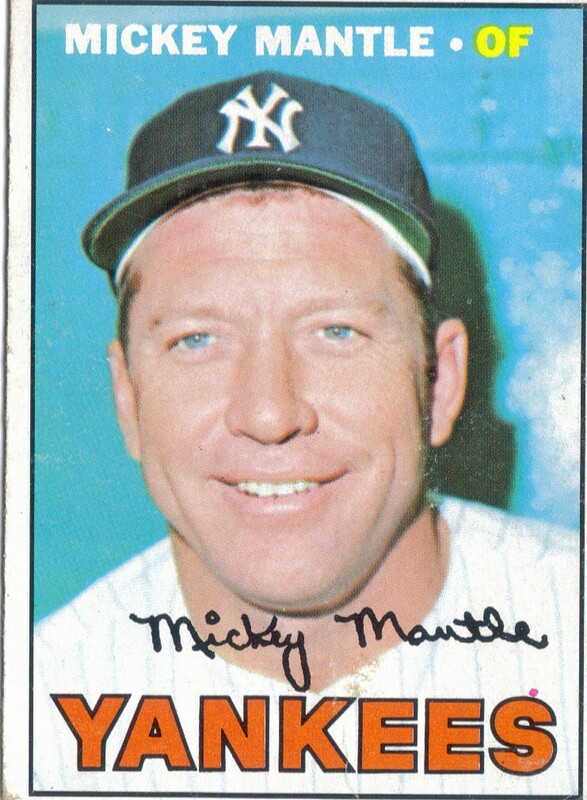 I already have Mantle, Banks, Stargell and Rose, to name a few. Not bad. One of my main goals is to complete the 1959 set while I am there, and maybe another would be to make a dent in the 1969 set. 1967 will definitely be on the backburner, but I am happy that I took the time to list what I needed. It will help me to go in there with lists of what I need, instead of going in blindly and being overwhelmed by everything. We shall see if it helps. I've opened a few packs of 2015 Finest at my local card shop and have been really pleased with the results. I already have pulled two autos, one of which is the above Dilson Herrera. The card is numbered 1/150, which I thought was pretty cool. I plan on taking the card with me to next weekend's card show in Raleigh, maybe I'll be able to sell it for a little bit. We'll see. Anyway, I like this year's design of Finest. Of course, Finest always looks good, so that's kind of a given. I've been able to pick it up by the pack at my LCS, since he opens up one of the little boxes and sells packs individually for the folks who can't afford to buy the mini boxes. I like that arrangement. Ask anyone who knows me how I feel about the New York Yankees. As they run away with the AL East this season, my disdain for the Evil Empire continues to fester and grow, as it has since some little brat interfered with a play in a playoff game back when Bill Clinton was president. As my collection continues to grow and evolve, I have noticed something happening, especially recently. I have noticed that I have quietly amassed quite the vintage collection and among some of my favorites are Yankees. 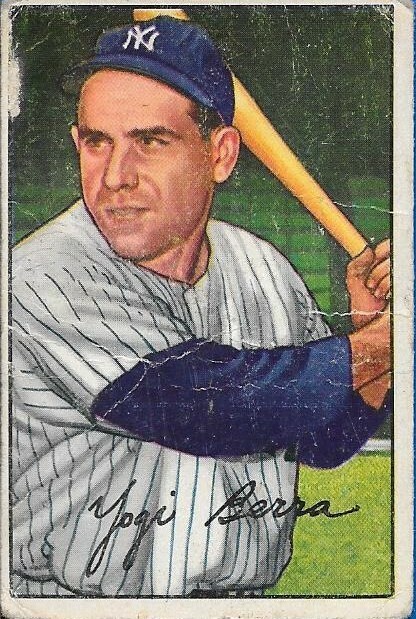 Several of my favorite cards in my collection are Mickey Mantles, and I noticed recently that I have a BUNCH of vintage Yogi Berra cards. I just have gotten lucky at shows lately and in trades. 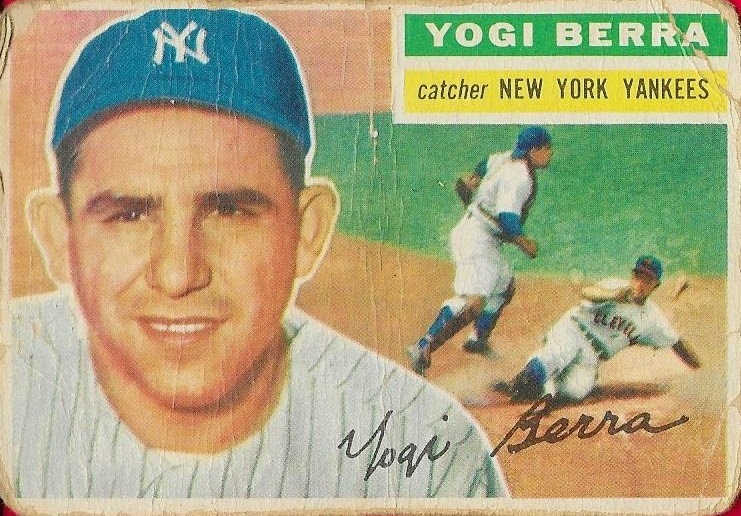 I have found a lot of Yogi cardboard and was smart enough to grab them when I could. It helps that I had a discussion with my good friend, and Yankee fan, Drew, about a year ago which consisted of analyzing stats of some legendary catchers. 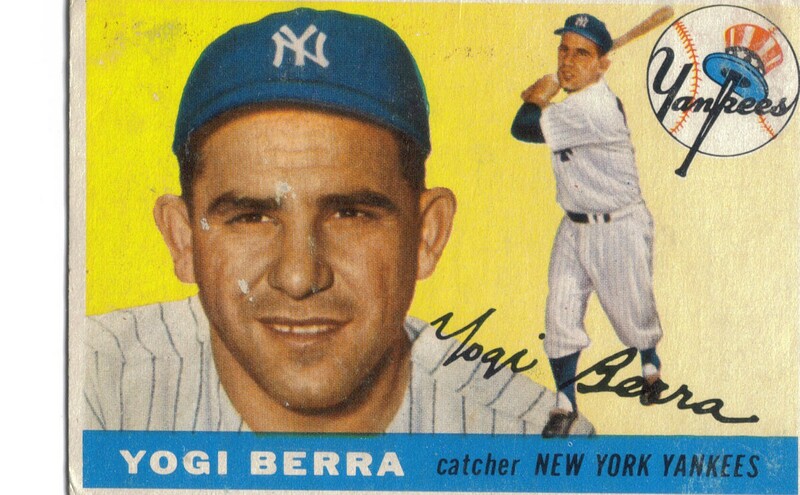 Yogi, for the most part, turned out to be the standard bearer when it came to legendary catchers. He also has 10 World Series rings, which doesn't hurt. He's Yogi. He's a legend. Yet, when it comes time to recognize said legend, Yogi always tends to need some help. 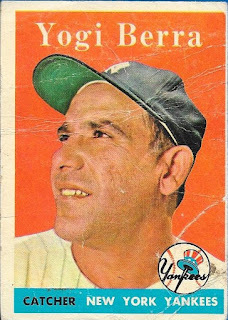 Just recently, Yogi needed an online petition to allow his name to be entered into consideration for the Presidential Medal of Freedom. Maybe this will be one time where the president actually performs an act that The People really want, instead of something he thinks they want. 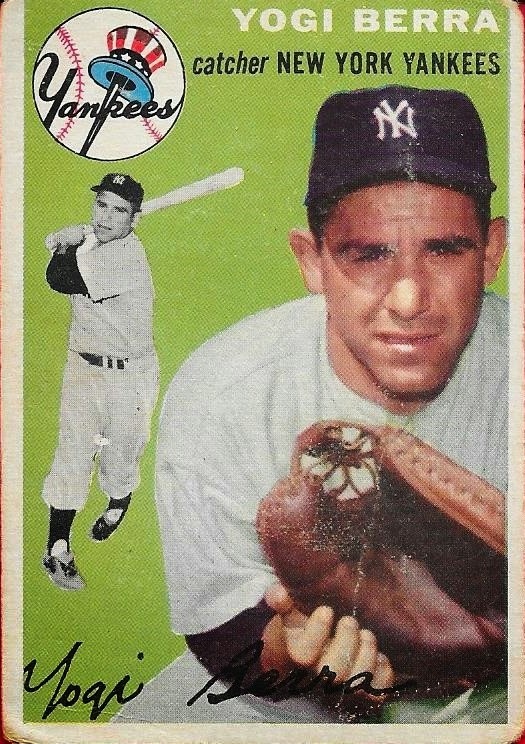 Additionally, Yogi didn't make the cut for the Yankees' franchise four that was announced a few days ago at the All Star game. DiMaggio made the cut, and Yogi is left out. 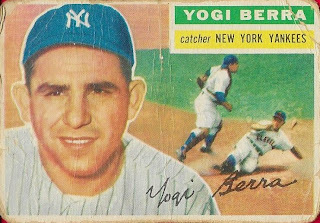 A compelling argument can be made to include DiMaggio in the Franchise Four, but I would honestly like to hear the argument AGAINST Yogi. Seriously, I want to hear it. Ten rings carry a lot of weight. Their weight in gold, so to speak. Yogi and DiMaggio have similar career numbers. MVPs: Yogi - 3/DiMaggio - 3; Rings: Yogi - 10/DiMaggio - 9; World Series Appearances: Yogi - 14/DiMaggio - 10; Hits: Yogi - 2,150/DiMaggio - 2,214; Homers: Yogi - 358/DiMaggio - 361; Avg. 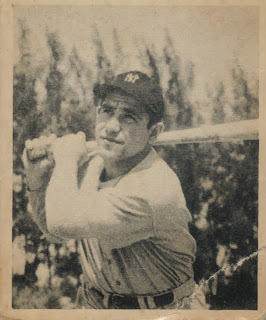 : Yogi - .285/DiMaggio - .325. DiMaggio and Yogi could probably be swapped and Yankee fans would be ok either way. I won't go into the travesty that was the "living Franchise Four" that also saw Yogi left off. 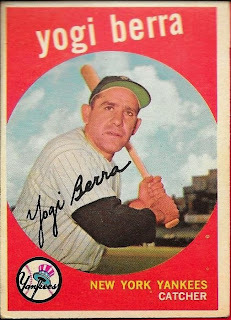 I just feel that Yogi is kind of underrated when it comes to legendary players, and could quite possibly have his legend grow far after he is gone. Lucky for us, at 90 years old, he is still around. Sadly, it won't be for much longer, but I, for one, am glad I was able to realize and appreciate him before he was gone. It has been a struggle lately to find stuff to write about. I have been trying my best to save money for The National, which is in less than two weeks. So, I haven't been buying much, and with the Raleigh card show coming next weekend, I haven't made very many trades. I have been hoarding my trade bait so that I have some stuff to sell at the show. Hopefully, I can raise some additional funds for my National trip. I have, however, bought a few packs of cards here and there, some of which have been 2015 Topps Gypsy Queen. I guess you could say that I have bought the packs in hopes of pulling another 1/1, like the graphite parallel of Dee Gordon that I pulled recently. I always enjoy Gypsy Queen when it comes out, mainly since it is flush with Hall of Famers. 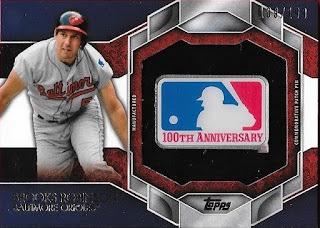 I was very pleased to pull the above Brooks Robinson. The card was a nice addition to my Brooks PC. The set, as a whole, is nice. 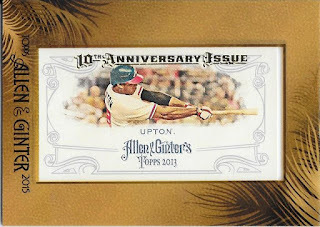 I do believe that Gypsy Queen, much like Allen and Ginter, may be losing its luster. I think Topps should maybe feature some other vintage designs, like American Caramel, Old Judge, or something like those. What do you guys think? Which past brand/design should Topps revive next? I just finished watching MLB Network Presents - Buck Showalter. Man, it was a really good interview with the Orioles manager and reminded me, just how much I love having him manage the Orioles. 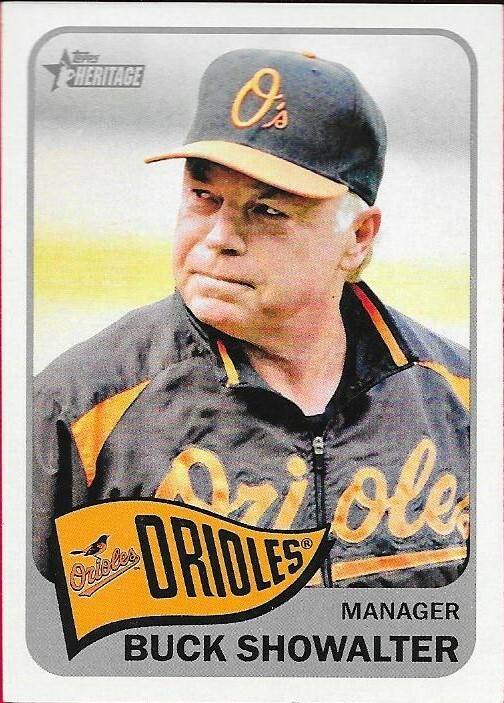 The O's had been through a ton of managers before Buck arrived on the scene at the end of the 2010 season, and now they have had three straight winning seasons, and two playoff berths. The one thing that Buck is missing in his legacy as a great manager is a championship. It seems that when Buck's contract expires at the end of the 2018 season, he will hang it up for good. The window to bring home a ring is getting short, and I sincerely hope that he can win a World Series before all is said and done. If you have MLB Network, I strongly suggest you check out the interview. It was really well done. 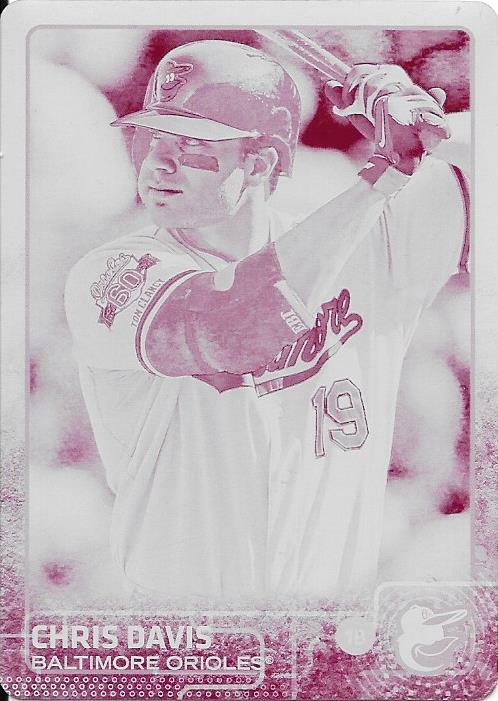 I found another Chris Davis printing plate from 2015 Topps on Ebay, so I had to pick it up. This one cost a lot more than the black printing plate I got the other day, but I was ok with it. From what I understand, it takes four printing plates to make a card, black, yellow, magenta and cyan. I now have black and magenta, so I could quite possibly land the other two if I see them available. It would be really cool to have the "rainbow" of printing plates, but I am not holding my breath. I will keep an eye out, nonetheless. 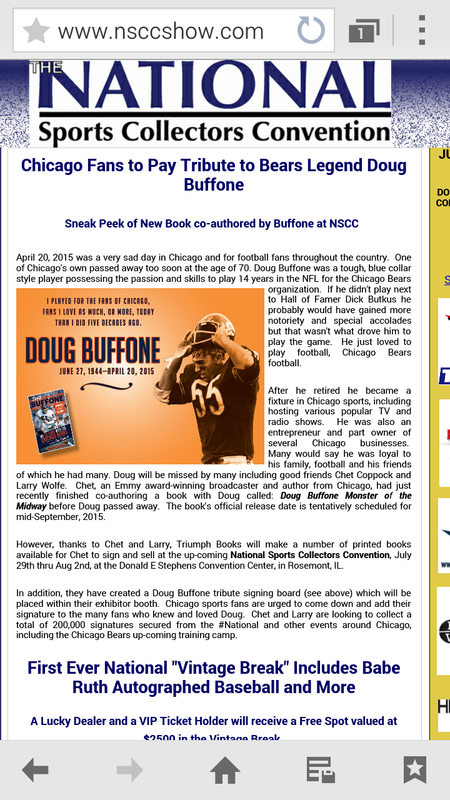 In just a couple weeks, we will be boarding a plane to Chicago in order to attend the National Sports Collectors Convention. I bought myself a VIP pass, but I probably will miss the sneak peek on Wednesday, since we land a bit late. Oh well. Going to the National was my very good friend, Andrew's idea. After we met up and hung out last year, he and his family were looking for a reason for all of us to get together again, since we all hit it off so well. So, the plan is for me to hang with Andrew most of, if not the whole, time while we are there. I went to the National when it was in Baltimore in 2012 and had a blast. 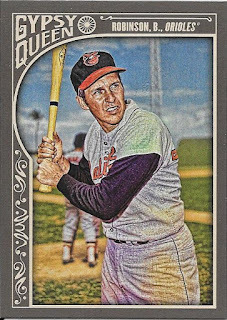 I purchased several autograph vouchers for this year, the one I may be most excited about is someone I already met before, Brooks Robinson. Brooks was ill when the National was in Baltimore, so I didn't get a chance to have him sign this photo of us together. This was shot back in 2009 when my brother, Andy, and I attended the "Evening With Brooks" event in Baltimore. I had an 8x10 printed of this photo, and want to have Brooks sign it. I plan on adding at least one new Hall of Fame signed baseball to my collection when we meet Lou Brock. I have been meaning to get his auto for a while, now, but haven't jumped on one. Brock was one of the few on the docket that I could afford, that I didn't yet have. Andrew and I will both be meeting Brooks and Brock. 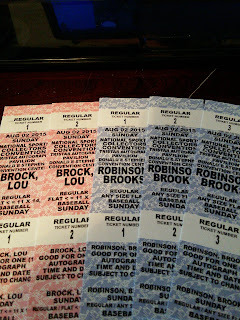 I also have a ticket for my son to meet Brooks. I thought I was done buying autograph vouchers until a couple days ago when I saw that Hulk Hogan was a late addition to the lineup. Actually, he and Ric Flair will both be there, but I have already met Flair twice. I was really excited to tell Chris, my son, that he would have a chance to meet Hogan. 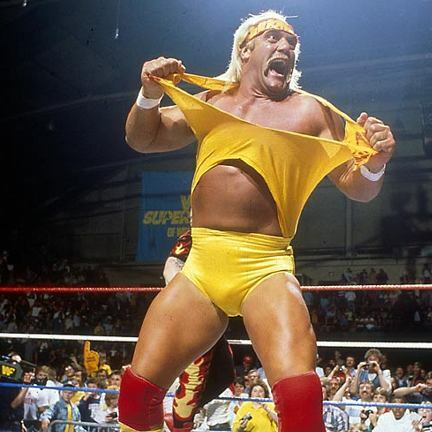 Hogan was an icon of my childhood, and it will be so cool to meet him and get his autograph. I also paid for a photo op for Chris, so he can get his picture taken with Hogan. It cost quite a bit of money, but I think the memory I'm making for him will be worth far more than anything else I could buy with it. Finally, I have built up a nice budget for the show, and I fully intend to use it on some good stuff. 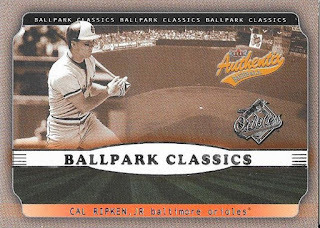 Hopefully a few signed baseballs, maybe a few vintage cards, but my main goals as far as cards go are really only two: complete the 1959 Topps set, and don't leave the show without the 1992 Donruss Elite Cal Ripken autograph. Those two goals are easily attainable, and I believe I can accomplish them. Most of all, I plan on meeting up with a few friends from the blogs and Instagram. I know I will be able to finally meet my good friend, Max, in person. We also plan on hanging out with a few others like Caleb, Frankie and many more. I'm really excited. I'm counting the days, and have already started gathering up some stuff that I will be bringing along. 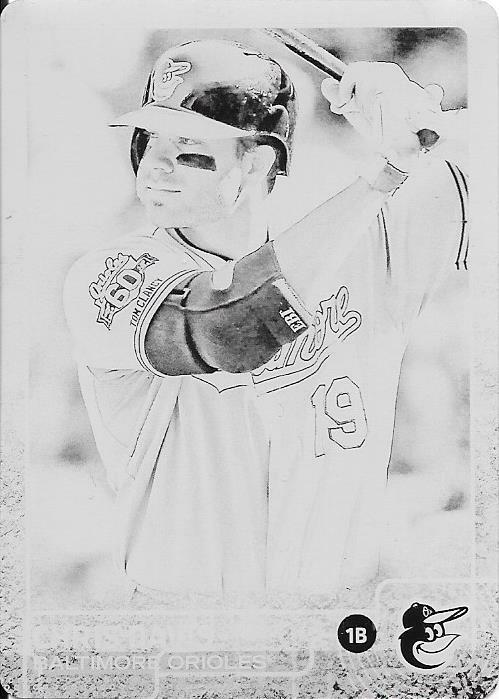 I picked up a nice addition to my Davis PC recently when I found this 1/1 black printing plate on Ebay. I was able to get it at a pretty good price via auction, and it came in the mail today. I still need to find a platinum 1/1 of Davis somewhere so I can have some hope of completing a rainbow. I doubt that day will come, since those platinums are so hard to find. Anyway, I can take comfort in the fact that I landed a plate for the collection, and one that looks really cool. The best part is, I actually was able to win another plate of Davis from 2015 Topps, the magenta, and it should be here any day. I'm not in a good mood. A look at the box scores from this past week would indicate that the Orioles are not a very good team right now. I sincerely believe that their hitting coach should begin to print off some resumes, because he really hasn't shown me much of anything this season, except for brief flashes here and there with a few players. 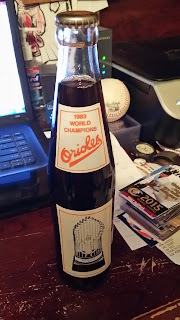 So, on a day where the Orioles make like they will never win another game, I got something in the mail that instantly cheered me up. 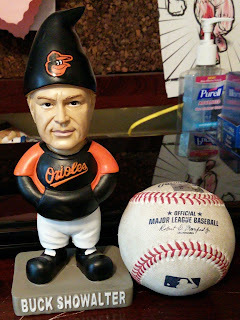 I got my Buck Showalter garden gnome in the mail from my friend, Michael. The garden gnome is really cool. I got a Rangers one a while back from my buddy, Sam, but this one is so awesome because Buck really didn't enjoy it. He made like he didn't at least. I think it is awesome, and will put it up once I am done writing this post. The baseball Michael sent is a game used baseball from the Orioles 5,000th win since the franchise moved to Baltimore. Michael found it at the Orioles memorabilia store, and immediately picked it up for me, knowing that I would want it. I don't know if I will get it signed by anyone, but at this moment, it will be put up as well. Thanks for the stuff, Michael. Maybe the Showalter gnome will now bring some good luck to the club and they can start to hit their way out of a wet paper bag. I worked out a deal with my friend, Michael, pretty quickly the other day and landed a few nice cards for my collection. This triple relic Chris Tillman card is really cool. It is numbered 36/99 and came out of 2010 Bowman. Tillman has been rough this year, but that has kind of been the O's season. Good at points, really rough at others. Uggh. Oh well. 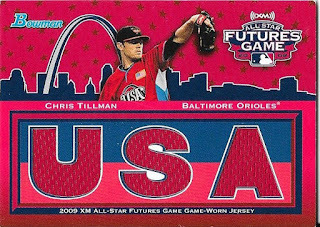 At this point, I've accepted that Tillman is probably a #3 or #4 starter, but we have him as a #1, and that isn't going to cut it. I wish he would turn it around and be the dominant pitcher I know he can be, but something just isn't right with him this year. 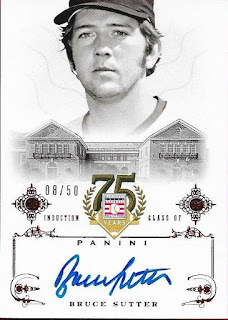 I picked this 2014 Panini Hall of Fame signed Bruce Sutter up from Michael in a mystery envelope for $5 that he was running. I got the card to round out my purchase, and I was pretty ok with what I pulled. 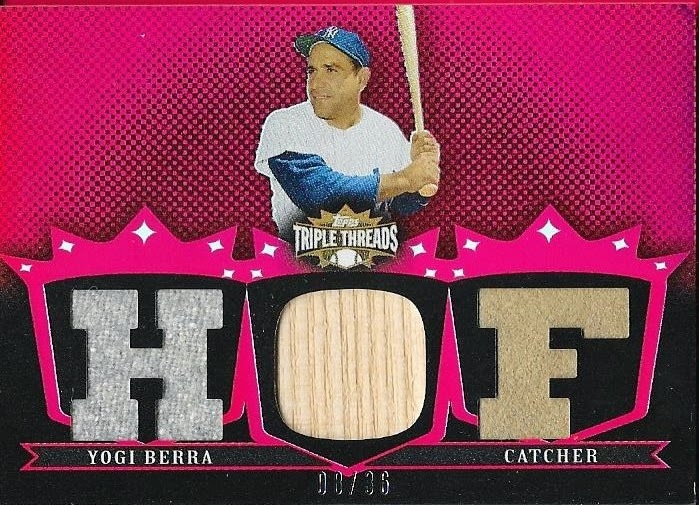 It is a nice-looking card and is numbered 8/50, so that's not bad. 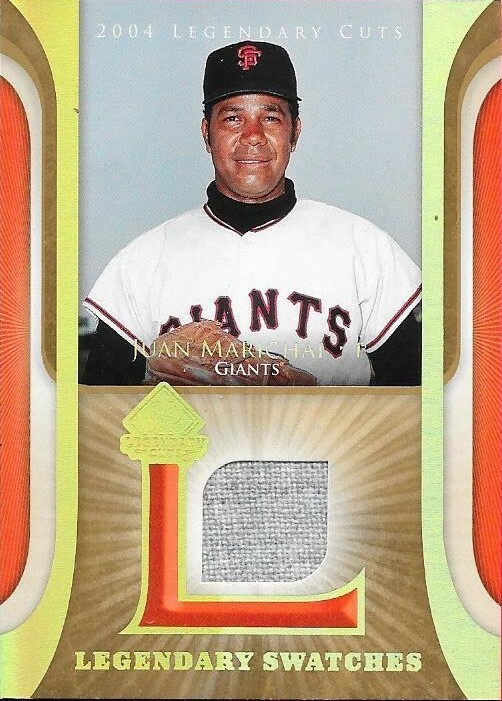 Finally, Michael threw in this nice 2004 UD Legendary Cuts relic card of Juan Marichal. Michael knows how I like wool jersey cards, so it was cool that he remembered and added it to the package. Thanks for the deal, Michael. I'll probably be holding off on any more deals (aside from the cards I have coming in this week) until after the National at the end of the month. I am selling at the Raleigh Card Show from July 24 to 26 to raise some more funds, then it is off to the National. I have a few things I intend to pick up, so I need to save as much as I can. It is often forgotten that there is another Bundy in the Orioles organization. 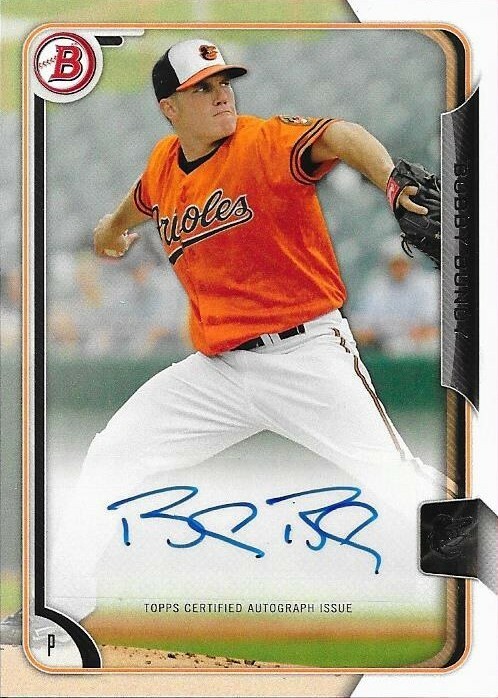 Dylan Bundy's older brother, Bobby, is also a pitcher in the O's minor leagues. 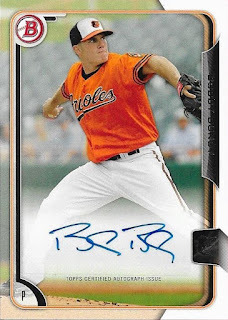 Drafted by the Orioles in the 8th round of the 2008 amateur draft, Bundy has slowly made his way up the ranks in the system. He is currently at AA Bowie. He has played in 8 games, pitching 15 innings this season. Both Bundy's have been quite injury prone, and it seems that neither will be with the Orioles after this season. That really is a shame, since Bobby's younger brother, Dylan, has been such a highly touted prospect. I got this card, a 2015 Bowman auto, from my friend, Nick S. on Instagram. Nick approached me and asked if I would be willing to take a deal for the card, and I accepted. 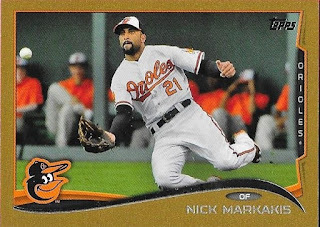 Nick was also nice enough to include a 2014 Topps Mini gold parallel of former Oriole, Nick Markakis in the deal. 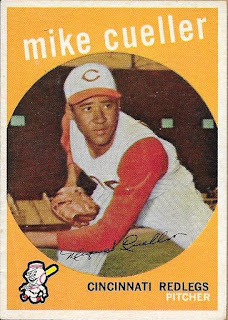 This card is numbered 57/63. I sure do miss Nick patrolling right field for the Orioles. It really is a shame that he wasn't resigned this offseason, but the O's were worried about a neck condition that Markakis had. The condition is, in fact, evident this season, as it has sapped him of his power. He typically averages 16 home runs a season, but through 81 games this year, Markakis has none. He is batting a nice .295 with 91 hits so far this year, but the power is gone from his game. I fear that he is definitely on the decline. That being said, I still respect Nick as a ballplayer, and miss him on my team. He was great for the Orioles, and I know he is missed among O's fans. Maybe one day, he will return to the organization. Thanks for the deal, Nick, I appreciate it! When I walked into the card shop last weekend, the new guy, Jacob, had something waiting for me. He had this 2015 Topps manufactured MLB pin that he had pulled. Naturally, I bought it off of him for a good price. It was his own, so I had to pay him and not the shop, but thankfully, we live in a world where I could just pull out my phone and pay him on the spot with Paypal. Pretty awesome. The card is numbered 109/199 and looks really nice. I'm not usually big on the manufactured "hardware" cards, but I had to get this for the Brooks PC. I would like to start off by wishing everyone a happy and safe 4th of July. I am going to catch a baseball game and some fireworks tonight, if the weather holds out. I busted a box of 2015 Topps Stadium Club last weekend and I was really impressed. As always, the photos in Stadium Club were amazing. 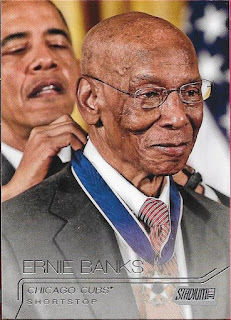 My favorite card of the whole bunch was this one of the late Ernie Banks receiving the Presidential Medal of Freedom in November 2013. I feel like this is a fitting card for Banks, who passed away earlier this year. 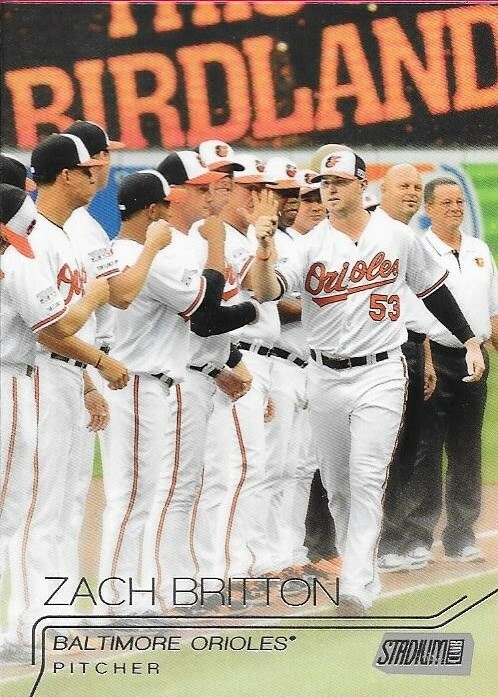 There are quite a few great shots of Orioles in the set, like this Zach Britton from last year's playoffs. 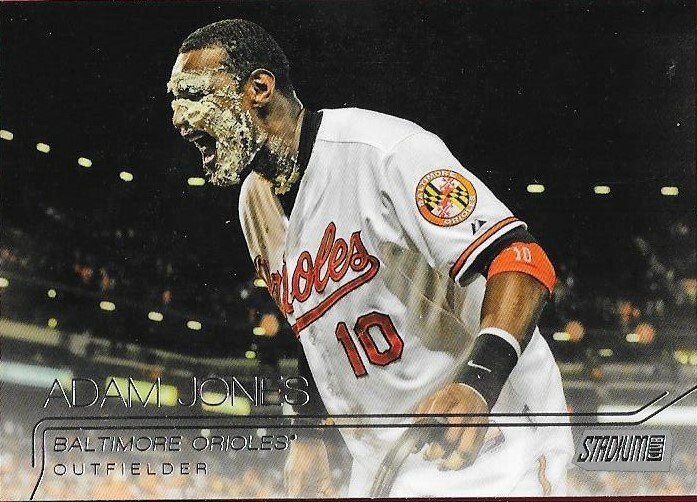 Here is a great pie face card of Adam Jones. 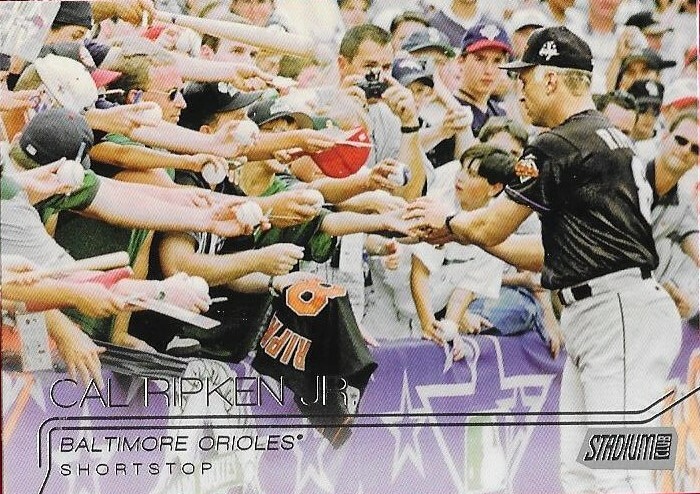 Finally, here is an amazing shot of Oriole legend and Hall of Famer Cal Ripken doing what he always did best, signing autographs. 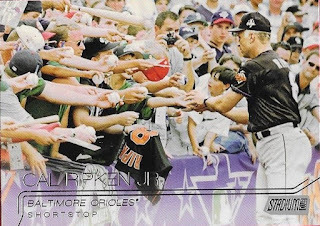 I ended up with two of these, so that takes care of putting something new into my Cal Ripken PC. I may actually pursue the set this year. I already have a good start, and these cards would look awesome in a binder. While I don't like putting my sets in binders, this one would be worth it. They would display far better in flippable sheets than stored in a box. I saw a version of this card at my local card shop a couple weeks ago and thought that it looked really cool, so I found one on Ebay at a good price. 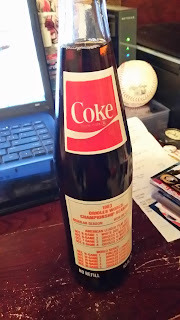 I got this one for $8.00 + $2.50 shipping. 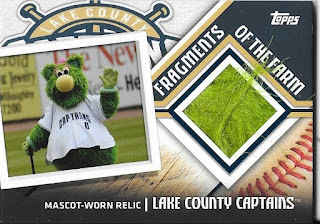 The Lake County Captains are a Class A affiliate of the Cleveland Indians based out of Erstlake, Ohio. Their mascot is Skipper, who debuted with the team in 2003. 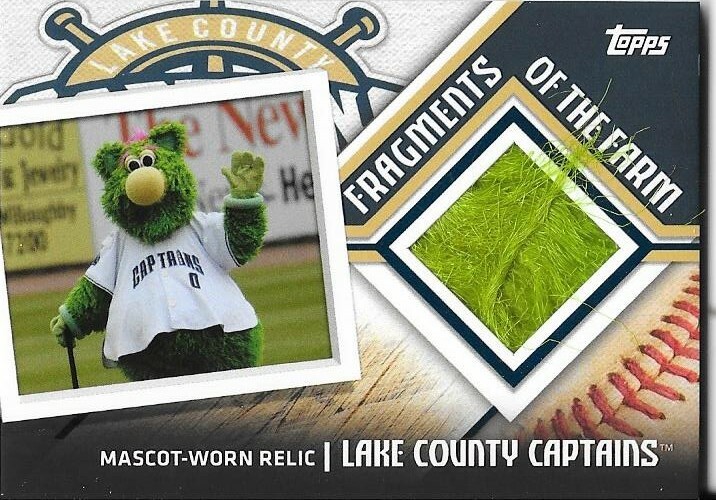 From what I recall, I have never seen a mascot relic card, but I could be wrong. I have seen the Topps Opening Day mascot autographs, though. I just thought it was a really cool card. I hope the mascot hasn't gone missing and wasn't sacrificed to make this card. 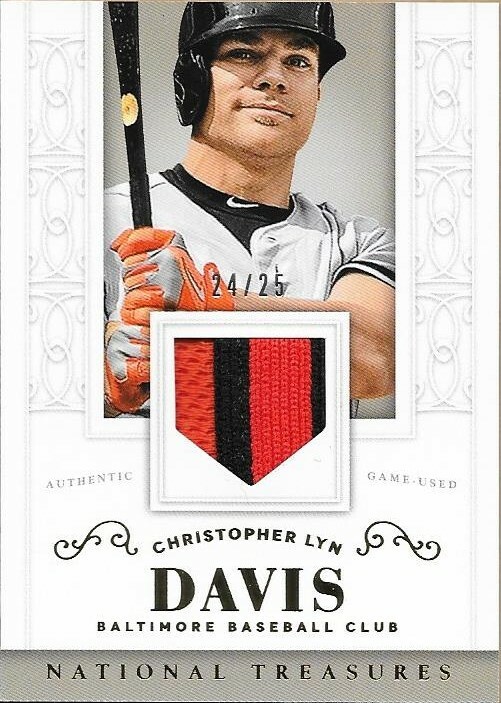 I got another Chris Davis parallel knocked off of my list. This snow camo parallel was less than $5 on Ebay, and is numbered 70/99. I have knocked out a couple of his parallels so far, most notably, the clear acetate parallel. Davis has been hot lately, smashing two home runs last night, and is at 18 on the season. 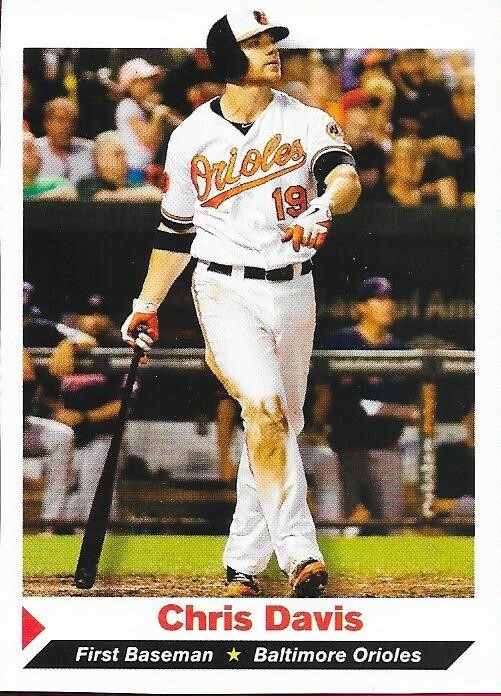 I'm holding out hope that the Orioles can keep him beyond this year, but with Scott Boras as his agent, it looks like Davis will be playing elsewhere next year. I'll still be a fan of his, unless he signs with an AL East team. Until that day comes, I will continue to keep finding parallels. Actually, if he does, in fact, sign with another team, I will still PC his Orioles cards.